This is a simple and gorgeous dish. It does take a bit of time, and it takes a few special pieces of equipment, but it's worth the investment in both. The recipe calls for a non-stick, oven save skillet and while you might not need a mandolin, I really can't imagine doing this without one. I've made this recipe a few times and followed the directions from the original to the letter - a rare thing for me to do. We've had this as a side dish for stepped up dinners, but with a nice salad it would be a great main dish. Slice potatoes and place in a bowl of cold water. Rinse off starch, change water and rinse again. Thoroughly dry the sliced potatoes by arranging them on dish cloths and blotting off the water with fresh towels. Whisk 4 tablespoons of melted butter with the cornstarch, salt, pepper and rosemary in a very large bowl. Toss in dry potato slices and stir to coat with butter mixture. Place the skillet over medium heat and melt the last tablespoon of butter. Remove from heat to layer the potatoes. 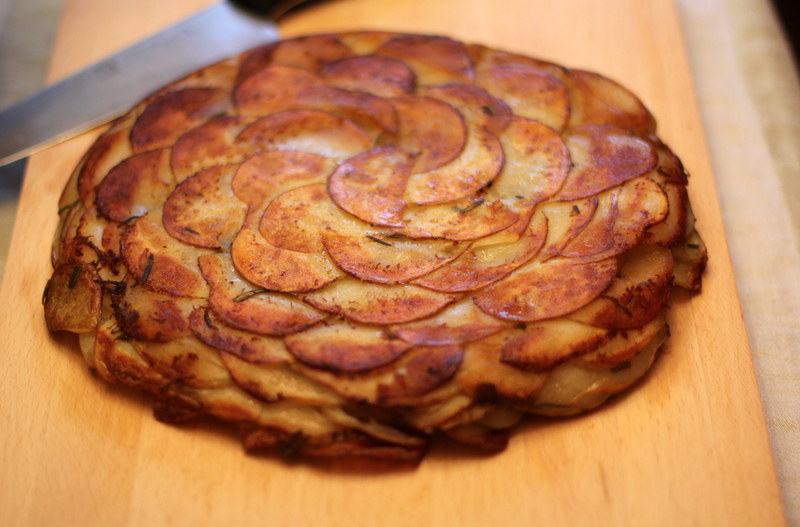 Arrange the first layer of potatoes in an overlapping pattern. This is what you'll see when you flip out the galette, so I tried to get a nice pattern going for that first layer. After the first layer, I really wasn't very careful. I just tried to get even layers. Once you've layered in all of the potatoes, cook about 5 minutes, or until the potatoes around the edges of the skillet start to turn translucent; about 5 minutes. Spray a sheet of tin foil with cooking spray and press onto the potatoes. Use a 9 inch pie dish weighted with pie weights and press down onto the potatoes (rice or dry beans also works if you are sans pie weights. Obvi, I'm sans pie weights.) Put the skillet in the oven and bake 20 minutes. Uncover the potatoes and bake another 20-25 minutes or until potatoes feel tender when pierced with paring knife. Place a wooden cutting board big enough to cover the skillet completely and with oven mitts on, flip the gallet out. Cooks Illustrated says you can cook the galette a few minutes longer on the stove top shaking a little to loosen the potatoes, but I didn't need to do this. Here I was photo bombed by our toddler. Cooks Illustrated calls the rosemary optional, but I really like the addition. I would try thyme in place of rosemary. The simplicity of this is amazing, but we are onion lovers and I'll try mandolin-sliced onions layered into this also. Maybe with some nutmeg and gruyere... oh boy. That sounds good. Drying the potatoes really well is REALLY important. 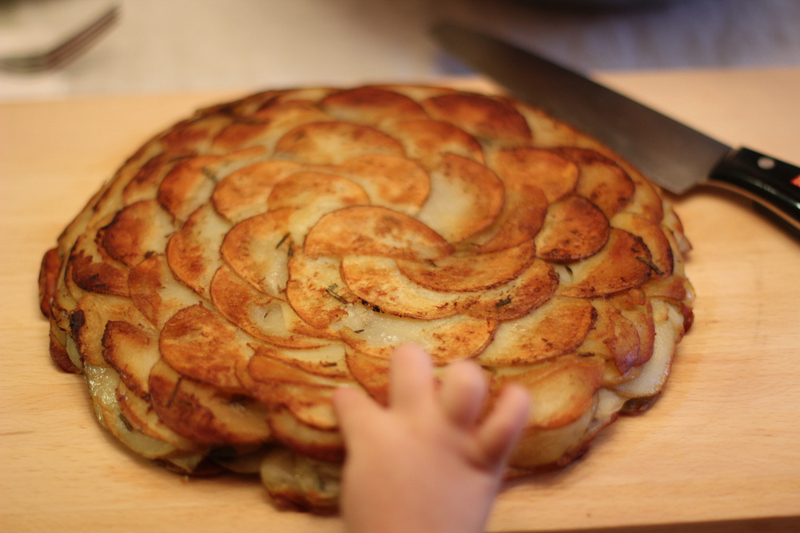 This dish can have a too-wet texture if the potatoes are wet when they go in the oven. Finding myself out of tin foil, I have used parchment paper sprayed with cooking spray in place of the foil... it worked just fine. Made a mistake, sorry f/ the deletion! I was looking at recipes using duck fat and one article said it's (duck fat) very good to use for this dish. Even though I've never made one, every few months I do a search for this recipe since I first saw it on America's Test Kitchen and decided I'd do an image search this time. I'll have to say, that's the prettiest galette on the 'net! Thank you so much for your comment! I'm so glad this picture represents how delicious this was! I bet duck fat would be amazing. I'll have to try that! !